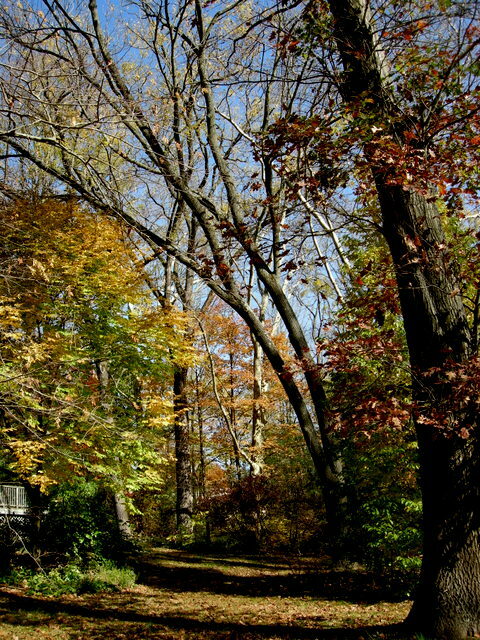 A view across the lake of the color in Peirce’s Woods, an area of native plants. We have been having one of the most beautiful falls that I can remember. Every day is bright and sunny, between 50 and 60 degrees F (10 to 15.6 degrees C) except when we have just the right amount of rain. 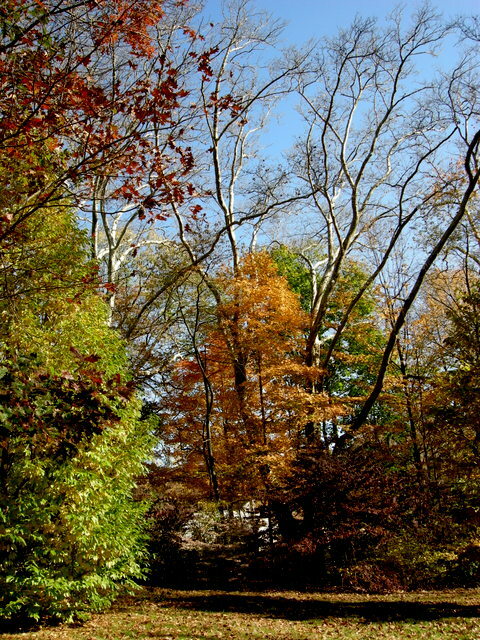 The fall color on trees, shrubs, vines, and perennials is spectacular. I am blessed to live in an area where I can enjoy one of nature’s most majestic shows just by walking outside my door. So I decided to post photos for gardeners in the US and abroad who don’t experience this amazing prelude to winter. 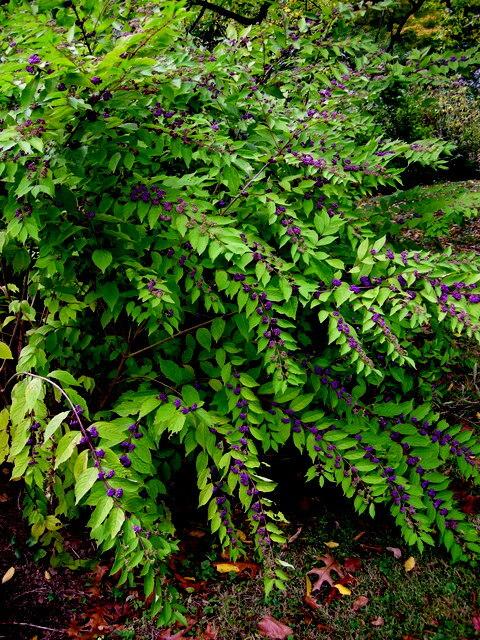 Nursery News: Carolyn’s Shade Gardens is a retail nursery located in Bryn Mawr, PA, specializing in showy, colorful, and unusual plants for shade. The only plants that we ship are snowdrops and miniature hostas. For catalogues and announcements of events, please send your full name, location, and phone number (for back up use only) to carolyn@carolynsshadegardens.com. Click here to get to the home page of our website for catalogues and information about our nursery and to subscribe to our blog. Bald cypress, Taxodium distichum, native to PA.
All but two of these photos were taken during a visit to Longwood Gardens in Kennett Square, Pennsylvania, US, on November 2. 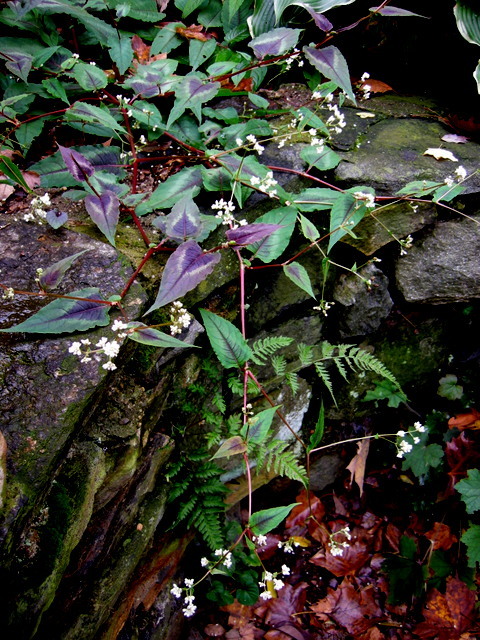 Every plant is native to the US and most to Pennsylvania (PA), which is part of the mid-Atlantic. 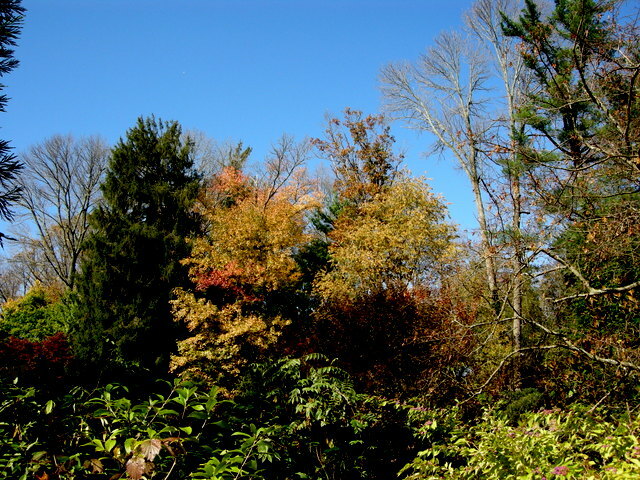 A similar color riot is still going on today, November 12, in my own PA garden. Pitcher plants, Saracenia, native to PA, even the planters near Peirce’s Woods are filled with natives. One of my top five shrubs: oakleaf hydrangea, H. quercifolia, and fall color is a big part of that along with gorgeous flowers, tropical-looking leaves, peeling cinnamon bark, and its status as a native albeit slightly south of PA. The words “jewel-like color” were made for oakleaf hydrangea. Flowering dogwood, Cornus florida, native to PA, one of the best small trees for fall color not to mention spectacular flowers and fruit as well as a unique and elegant habit. This is a young specimen. Bottlebrush buckeye, Aesculus parviflora, a PA native with beautiful flowers in the late spring. Great for creating a grove in dense shade and dry soil. 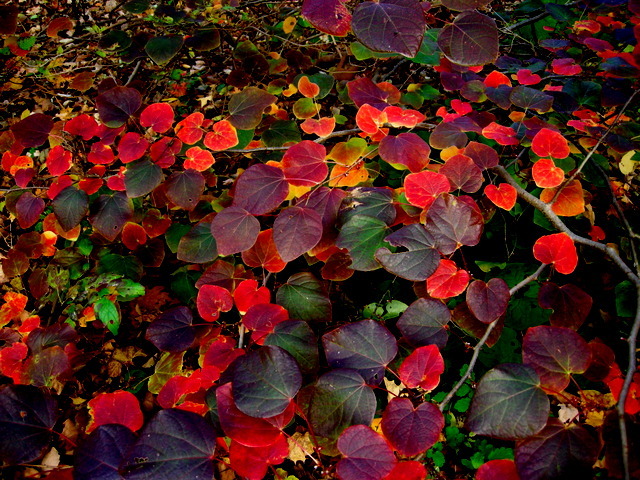 Fothergilla, F. gardenii, native just south of PA, provides a mix of oranges, reds, and yellows that lasts a long time. In the spring it sports lovely fragrant flowers. Looking across the lake towards Peirce’s Woods, the red tree to the left of center is a red maple, Acer rubrum, and the smaller peachy tree to the right is sourwood, Oxydendrum arboreum. Red maple is a shade tree native to PA. It colors early so I was surprised to find it still stealing the show. Here is a view from the other side looking down at the lake. 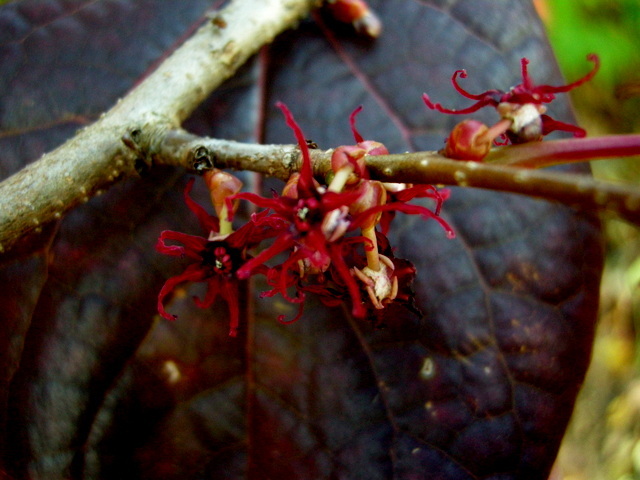 Sourwood, also known as dead man’s fingers due to the unusual habit of its flowers, is a smaller flowering tree native to PA with many ornamental attributes including unbelievable fall color. ‘Prairie Sentinel’ pond cypress, Taxodium ascendens, has a more upright habit than its cousin the bald cypress and is native just south of PA.
For all-round large shade tree, I would nominate the sugar maple, Acer saccharum, native to PA. Photos don’t do its color justice, and large specimens have a habit that is purely regal. This one is a youngster. I had to throw in this photo from Carolyn’s Shade Gardens of ‘Hartlage Wine’ allspice, Calycanthus raulstonii. Top five shrubs again with absolutely gorgeous, bright yellow fall color; long-lasting, exquisite, large red flowers; and big, shiny, smooth blue-green leaves. It is a native hybrid. Also from Carolyn’s Shade Gardens, another favorite tree native to PA, yellowwood, Cladrastis kentukea. Nursery Happenings: You can sign up to receive catalogues and emails about nursery events by sending your full name and phone number to carolynsshadegardens@verizon.net. Subscribing to my blog does not sign you up to receive this information. Please indicate if you will be shopping at the nursery or are mail order only. The sunrise lights up the heavy frost outlining the semi-evergreen leaves of native sweetbay magnolia. The berries of native winterberry hollies stand out in the landscape after their leaves have dropped. In my garden, robins strip the berries fairly early in the season, but I have noticed that in most locations they persist well into the winter. Fall-blooming hardy cyclamen is done blooming, but the leaves are gorgeous all winter. If you look closely, they all have a different pattern like a snowflake. Although I plant them where I want them, they move and thrive in sites of their own choosing. Here they were planted at the front of the bed and moved to the back directly at the base of a stone wall, one of their favorite sites. Here ants moved the cyclamen seeds about 30 to 40 feet up hill all around the base of a gigantic London plane tree where they have filled in and thrived. This is not an area of the garden that I visit often so you can imagine my surprise when I found this display. An Italian arum made the trek too. Kuma bamboo grass, Sasa veitchii, has plain green leaves during the season but acquires this elegant white edge for the winter. I planted my sasa over 10 years ago, and this is the first time that it has spread to a decent patch. Generally it is considered quite aggressive. Variegated East Indian holly fern, Arachnoides simplicior ‘Variegata’, is a beautiful evergreen fern. Before you go looking for it though, I think it is borderline hardy here and it doesn’t thrive. Fall-blooming snowdrops like ‘Potter’s Prelude’ pictured here are a highlight of the fall season starting around October 15 and continuing until early main season snowdrops take over in January. This photo could show any number of my evergreen epimediums, but this is E. stellulatum “Long Leaf Form”. 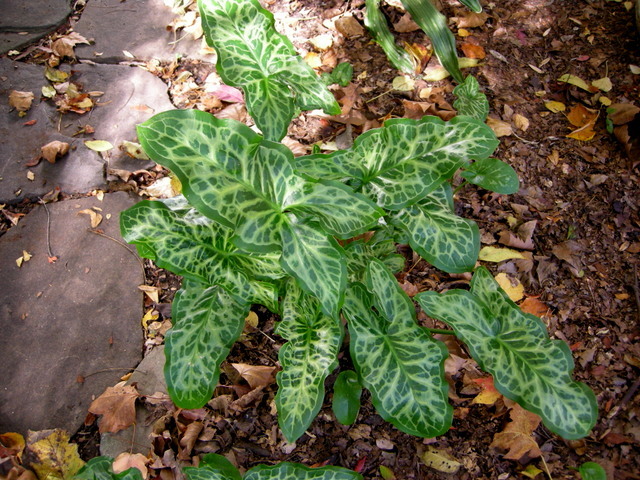 They all have very interesting and attractive leaves which persist until spring when I cut them back. 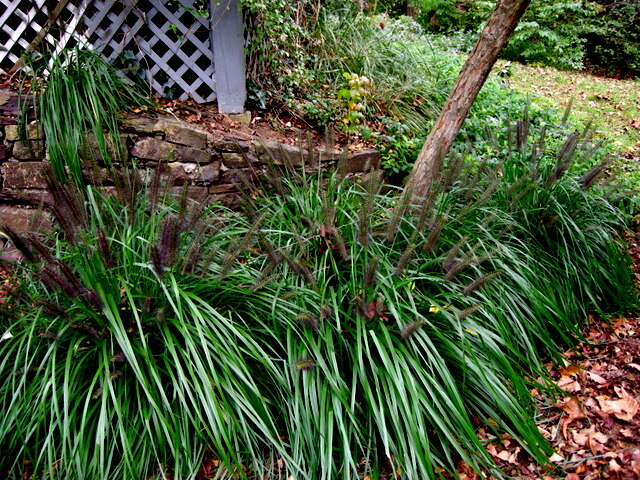 Black fountain grass, Pennisetum ‘Moudry’, remains my favorite grass. After a few hard frosts, it turns a lovely tan. It does move around quite a bit but has never gone anywhere that I didn’t want it in 20 years. It is downright invasive for others though, so beware. Italian arum stays fresh and beautiful all winter—it goes dormant in the summer instead. This cultivar is ‘Gold Rush’. Another Italian arum with much more white on the leaves—for comparison a typical arum leaf is on the left of the photo. It is possible to get a variety of leaf forms from specialized nurseries. Chinese fringe trees, Chionanthus retusus, produce lovely dark blue berries in the fall which persist after the leaves drop. This plant is the superior form ‘China Snow’. Edgeworthia is beautiful all year round but especially during late fall and winter when the large silver buds start to swell. The leaves turn bright yellow and drop, leaving the bare branches covered with delicate silver ornaments. 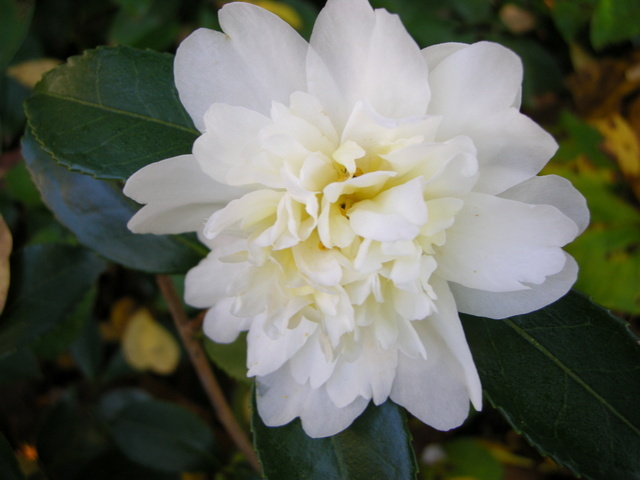 ‘Winter’s Snowman’ camellia blooms in November and December with large, semi-double white flowers. ‘Winter’s Joy’ produces hundreds of buds. When a hard frost turns the open flowers brown, new buds open and flowers cover the plant again as soon as it gets warmer. Although this is usually the case, it didn’t happen during the last two winters when the buds froze early. 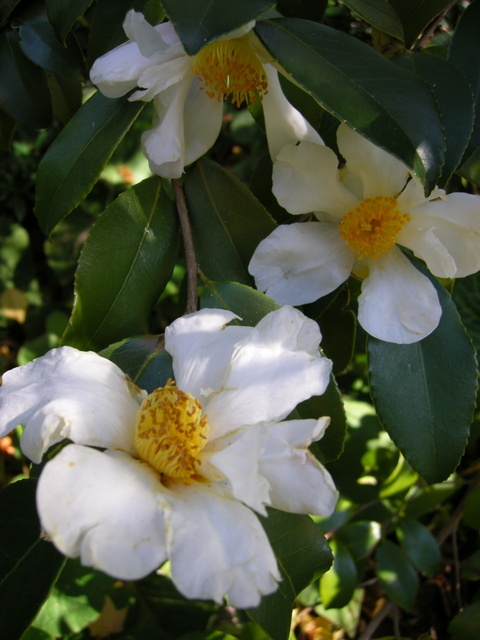 The tea camellia ‘Lu Shan Snow’, C. oleifera, is particularly cold tolerant and has thrived in my garden for almost 20 years. Camellias planted from 2013 on have been very hard to establish in the garden due to our unseasonably cold temperatures during the 2013-2014 and 2014-2015 winters. The camellias that I planted prior to 2013 have all thrived. Nursery Happenings: You can sign up to receive catalogues and emails about nursery events by sending your full name and phone number to carolynsshadegardens@verizon.net. Subscribing to my blog does not sign you up to receive this information. Japanese maples are a great source of November fall color because they lose their leaves later than most other trees. 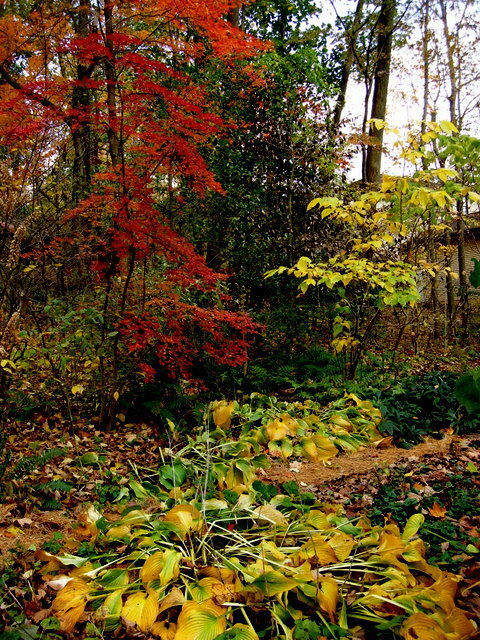 At Carolyn’s Shade Gardens, the landscape provides ornamental interest 365 days a year. To make this happen, I expect most trees and shrubs to have at least two ornamental qualities peaking at different times before they are given precious garden space. Ornamental interest can come from flowers, fruit, bark, leaves, habit, texture, and fall color. 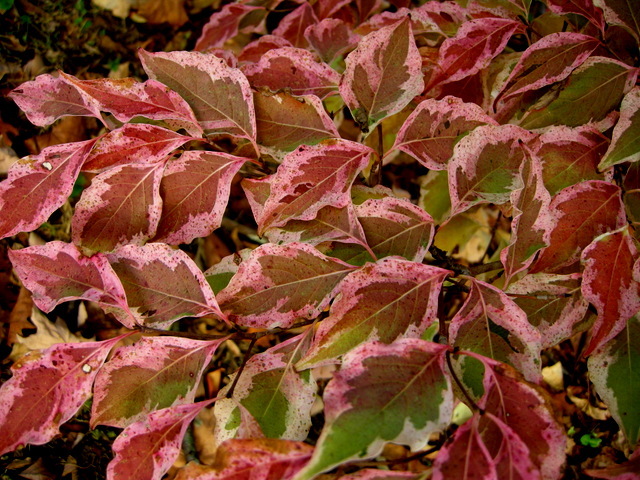 Brightly colored fall leaves are a wonderful way to extend your garden’s interest through November. Some of my favorite fall foliage stars are profiled below. Native oakleaf hydrangeas turn beautiful shades of red and then burgundy over a long period of time. 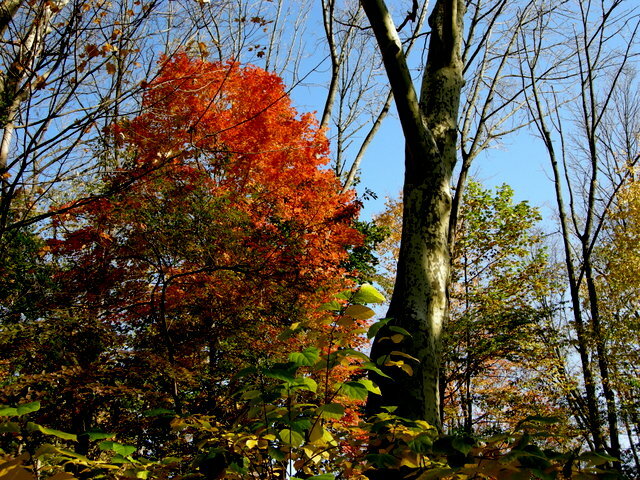 The leaves in the upper left of the photo are still green while the foliage in the upper right is deep burgundy. I also grow oakleaf hydrangea for its fresh and dried flowers, peeling bark, unusually shaped large leaves, walnut and dry shade tolerance, and tropical texture. It is a true four-season star. 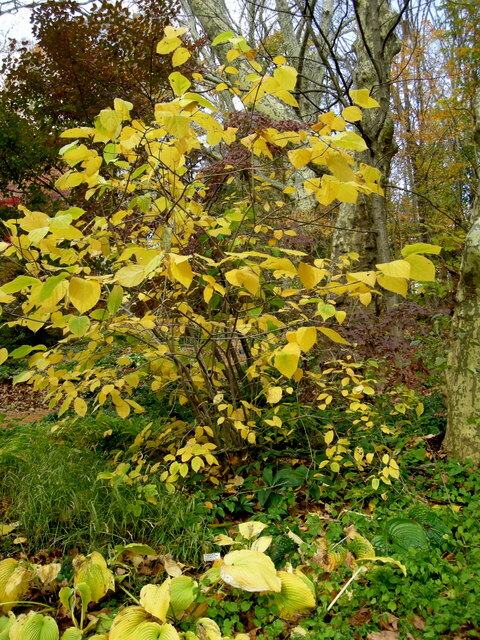 Plants in the witch hazel family often have elegant leaves and beautiful fall colors, and winter hazel, Corylopsis, is no exception. Here it is surrounded by ‘All Gold’ Japanese hakone grass. The lovely purple spots on the leaves of ‘Katherine Adele’ hardy geranium darken as the fall progresses. 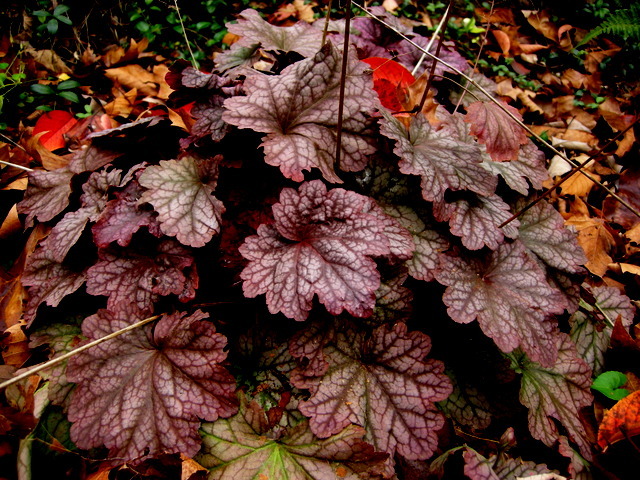 In mid-November, as other perennials go dormant around it, ‘Katherine Adele’ fills out and reaches an ornamental peak. I also grow it for its pretty pink flowers in spring. However, I grow many varieties of hardy geranium and this variety is the worst for self-sowing, and the seedlings are hard to remove. ‘Mohawk’ viburnum resulted from a cross between Burkwood hybrid and Korean spicebush viburnums. 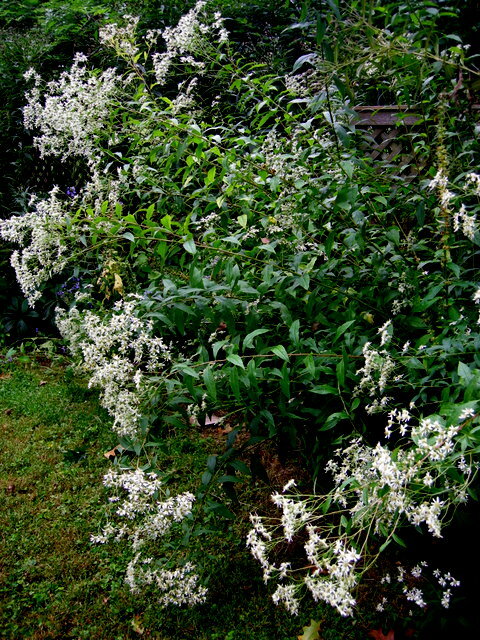 It is a medium-sized shrub with elegant and highly fragrant flowers. ‘Mohawk’, a Pennsylvania Horticultural Society gold medal winner, is particularly treasured for its stunning and log-lasting fall color. I also love the rose-red buds that precede the white flowers in April. My grove of native pawpaws turns a beautiful yellow in the fall. Very easy to grow, pawpaws produce an abundance of edible fruit with a taste and texture resembling banana-mango-pineapple custard. Fruit production is enhanced by planting two different cultivars. Native flowering dogwood, on the left above, turns a gorgeous red in the fall. Its flowers, fruit, bark, and habit are also highly ornamental. Witch hazels have a very unique yellow-orange fall color that stands out in the landscape. ‘Angelly’, on the right above, is my favorite witch hazel because of its striking, bright yellow, spring flowers, which made my choice easy when I was confronted with a greenhouse full of hundreds of witch hazels in bloom. ‘Angelly’s’ flowers stood out. It also has the crucial ability to shed its old leaves. Witch hazel flowers blooming among hundreds of old brown leaves are not attractive and removing the leaves by hand is a chore. Another perennial that comes into its own in the fall is Ruby Glow euphorbia or wood spurge. The leaves and stems darken as the season progresses and are much more purple now than when I took this photo on November 7. I also value Ruby Glow for its unusual chartreuse flowers in spring and its upright, shrub-like habit. Although its common name is wood spurge, it prefers a sunny location. Japanese maples have stunning fall color very late in the fall foliage season. They can self sow prolifically and have sometimes been called invasive. This tree was a seedling that appeared in my garden in the right place at the right time. In the lower right of the photo are the beautiful yellow leaves of native ‘Forest Pansy’ redbud. Generally unselected Japanese maples have red fall color. 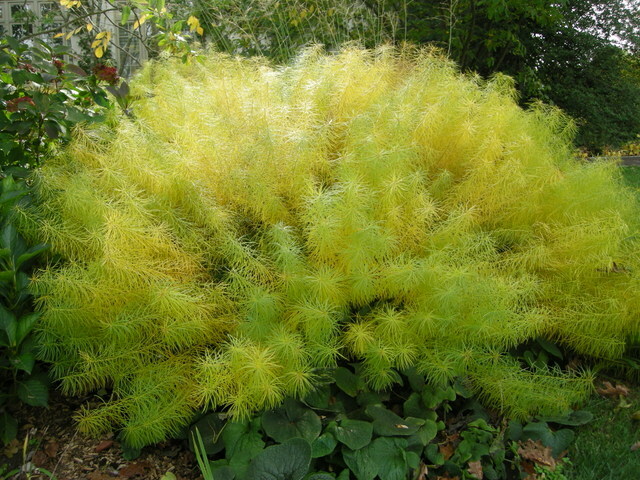 However, I prefer the seedlings that have yellow or orange foliage in fall. The above seedling growing out of the side of a giant London plane tree in my nursery sales area has multi-colored leaves. If you are considering adding a Japanese maple to your garden, you can choose from the hundreds of cultivars selected from Acer palmatum. The variety of sizes, leaf shapes, habits, fall colors, etc., available is amazing. Pictured above and at the top of the post is ‘Shishigashira’ or lion’s head Japanese maple, one of my favorites. 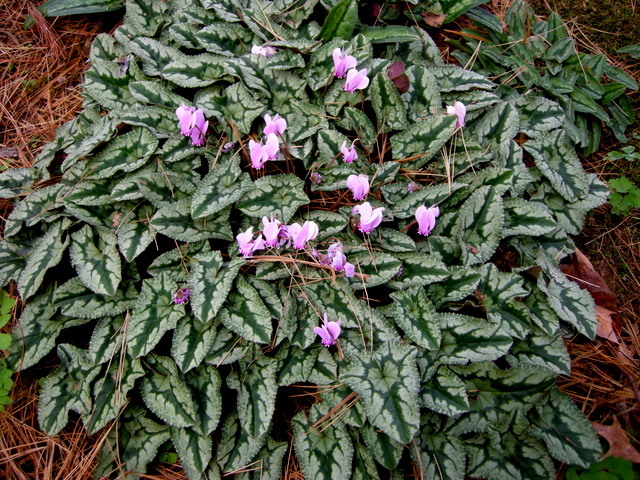 It is under-planted with ‘Shell Pink’ lamium and fall-blooming hardy cyclamen, fall stars in their own right. I will end this post with a photo of three spectacular native plants. The taller tree is yellowwood, valued as a medium-sized shade tree with beautiful, fragrant flowers and striking yellow fall color. The small tree is a flowering dogwood discussed earlier in the post. The shrub with the orange fall color is a flame azalea, one of our stunning native deciduous rhododendrons. What’s Ornamental in Late Fall? In my last post, ‘What’s Blooming in Mid-Fall?” (click here to read), I explained that fall has three seasons for me: the early season is September, mid is October, and late is November. I promised a post on the late season, which I fully intended to do at the end of November. Unfortunately, the weather in the mid-Atlantic US just proceeded from temperatures typical of mid November, highs in the low 50s and lows in the low 40s, directly to temperatures more appropriate to January. When I got up this morning it was 24 degrees, and tonight’s low is 19 (-7.2 C), followed by three more nights in the low 20s. Almost everything is frozen so I might as well do November now. 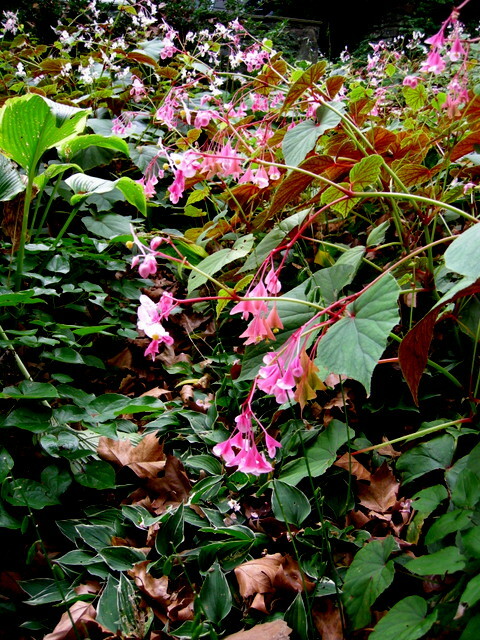 ‘Wolf Eyes’ has green and white variegated leaves during its main season and turns pink in the fall. 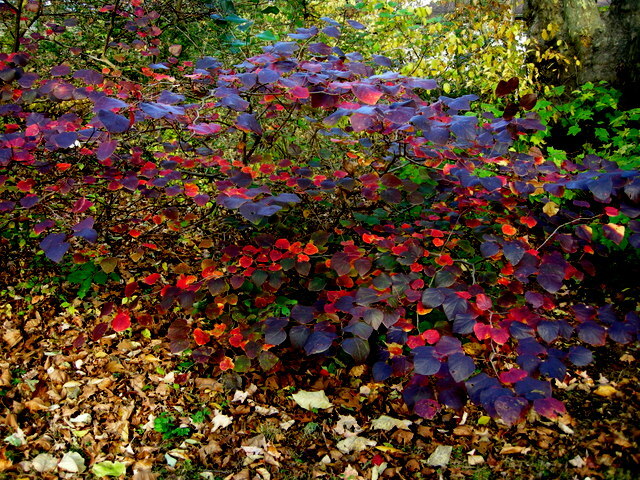 Generally I recommend our native dogwood for its superior shape, flowers, berries, and fall color and because it supports 117 species of moths and butterflies alone while Kousa dogwood supports no native insects of any kind (source Bringing Nature Home by Doug Tallamy). However, if you want to plant a Kousa, ‘Wolf Eyes’ is beautiful. Scarlet native dogwood on the left, orange witch hazel in the center, and brilliant red Japanese maple on the right. This is the hill above the Carolyn’s Shade Gardens nursery sales area. Native hybrid ‘Hartlage Wine’ sweetshrub turns a lovely butter yellow in late fall. All the blue hostas turn an attractive orange-yellow. 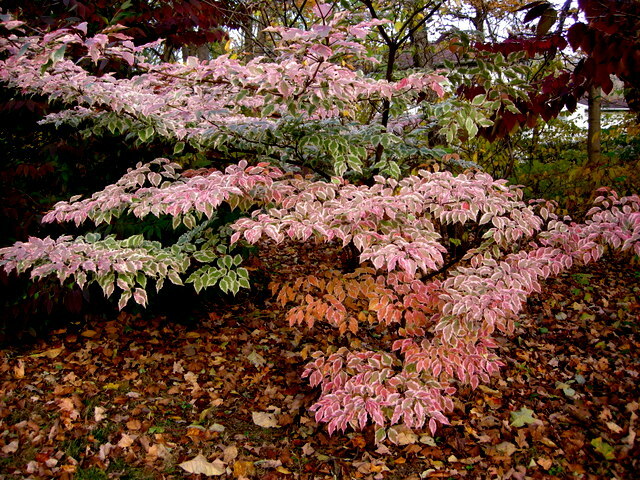 Here ‘Krossa Regal’ with the fiery orange leaves of enkianthus and a yellow Asian sweetshrub in the woodland. Disanthus cercidifolius is probably my favorite plant for November color. 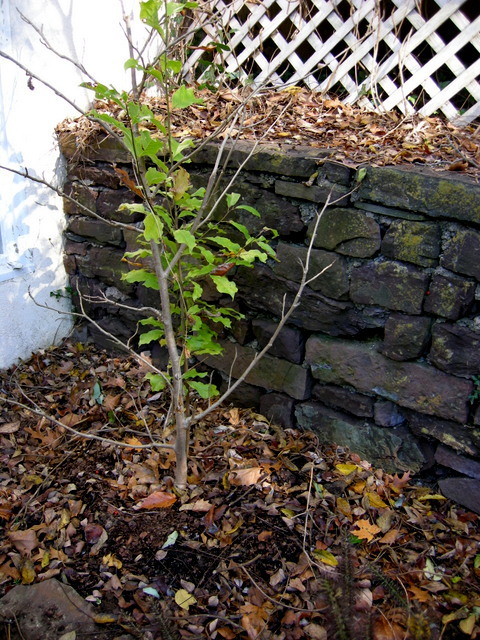 This photo shows the whole shrub, which is probably 10′ wide and 6′ tall, although it could easily be pruned to a smaller size. Some websites call it redbud hazel, but I have never heard that common name used. 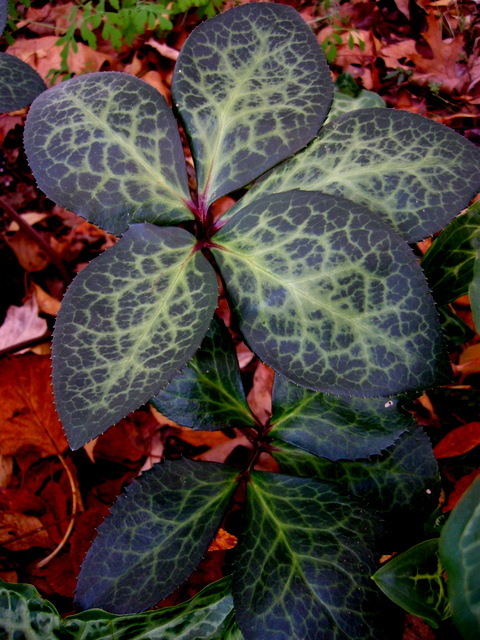 A close up of the leaves shows that disanthus displays many beautiful colors at once. 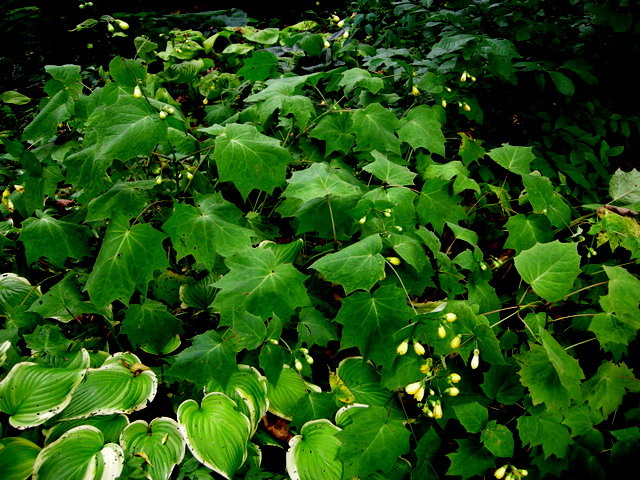 You can also see why it’s called cercidifolius, which means leaves like a redbud. Disanthus also blooms in November with tiny scarlet flowers. 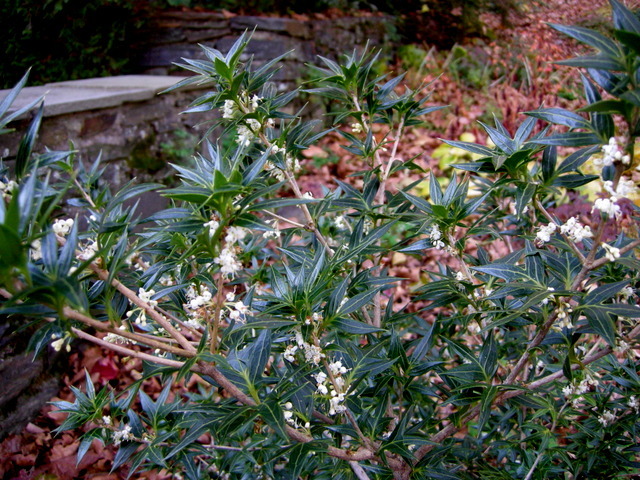 Another shrub that blooms in November is evergreen ‘Sasaba’ osmanthus. Again the flowers are not highly ornamental but they are amazingly fragrant, sweetly scenting my whole back hillside. 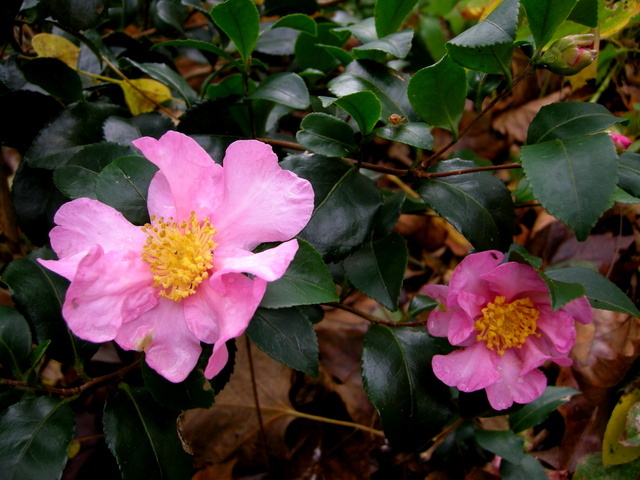 Fall-blooming camellias are the highlight for flowering shrubs in November, here ‘Long Island Pink’ which started October 15. ‘Snow Flurry’ also continues to bloom. ‘Winter’s Joy’ starts in November and often continues into January. I just hope its buds don’t freeze this week. ‘Winter’s Snowman’ also starts in November. I was going to show the whole plant, but all the open flowers froze last night. 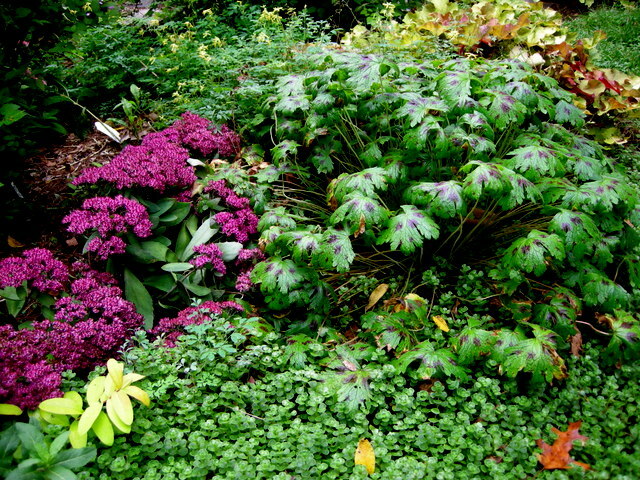 ‘Brigadoon’ St. John’s wort and ‘John Creech’ sedum were not fazed by last night’s low. This late-blooming monkshood is always a highlight of my November garden, although it froze last night. Shown here at Chanticleer. All the coralbells derived from our native Heuchera villosa keep their beautiful color in fall and through the winter, here ‘Berry Smoothie’. 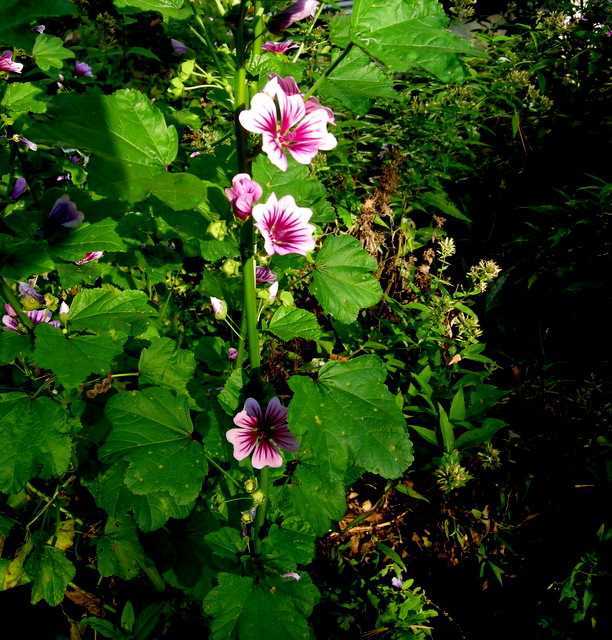 ‘Zebrina’ hollyhock mallow gets a second wind in the fall and is covered with blooms in November. Italian arum comes up in the fall and stays ornamental all winter, it’s amazing. 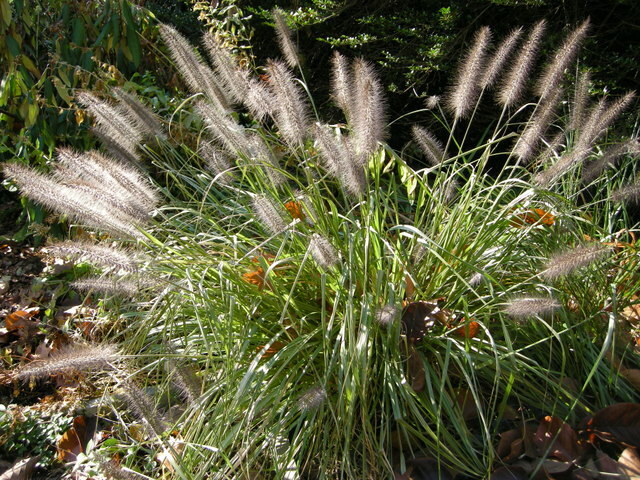 Fall light slanting through my favorite ornamental grass ‘Moudry’ fountain grass. Beware, ‘Moudry’s black plumes are quite striking, however, it can be quite aggressive. I didn’t actually plant any of these plants, but I love where they planted themselves. 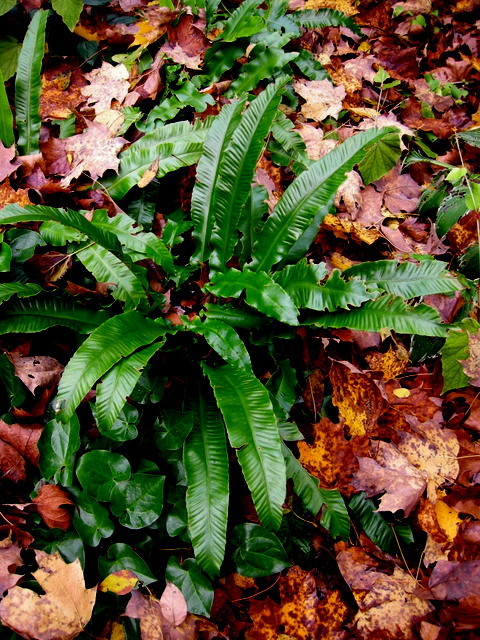 Hart’s tongue fern and evergreen epimediums are also beautiful right now and for most of the winter. Hellebores stay green through the winter, and some of them have spectacular leaves, here ‘Penny’s Pink’. I couldn’t finish without showing some snowdrops! 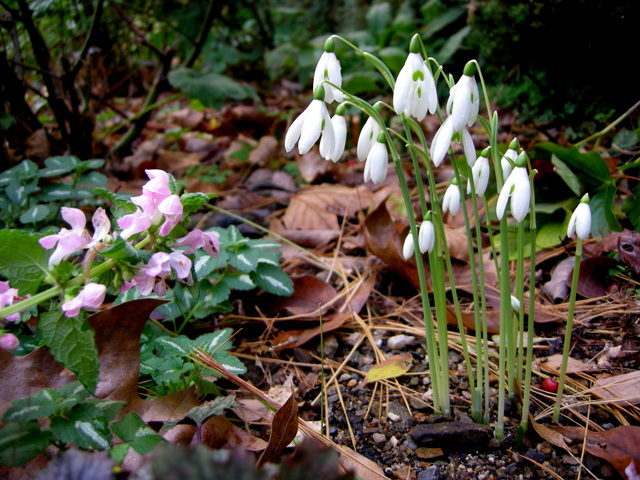 Galanthus reginae-olgae finishes blooming in the middle of November. I have a lot of fall-blooming giant snowdrops, Galanthus elwesii. Here is one that I have selected for its nice markings and because it produces two flower scapes per plant. It still looks pristine after last night’s freeze. Nursery Happenings: You can sign up to receive notifications of catalogues, sales, and events at the nursery by sending your full name and phone number to carolynsshadegardens@verizon.net. 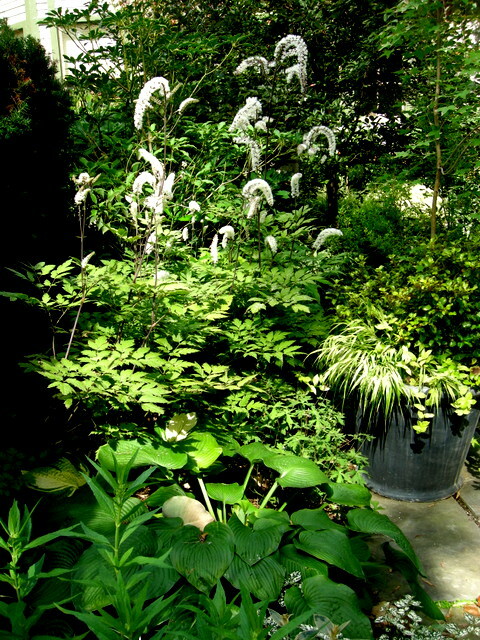 Carolyn’s Shade Gardens is a local retail nursery in Bryn Mawr, Pennsylvania, U.S., zone 7a. The only plants that we mail order are snowdrops and miniature hostas and only within the US. If you are within visiting distance and would like to receive catalogues and information about customer events, please send your full name and phone number to carolynsshadegardens@verizon.net. Subscribing to my blog does not sign you up to receive this information. ‘Limelight’ hydrangea, native blue wood aster, and native brown-eyed Susan (Rudbeckia triloba) shine through October. For me, fall has three seasons, early, middle, and late, and they do not conform to the calendar definition of fall. 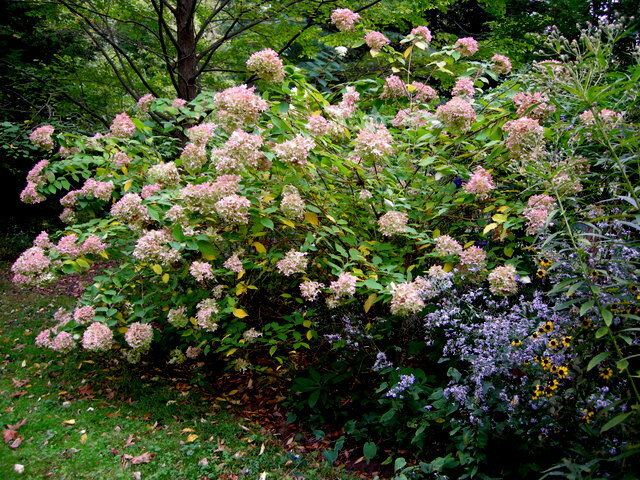 Early fall plants perform in September, a month that is technically summer until the equinox. 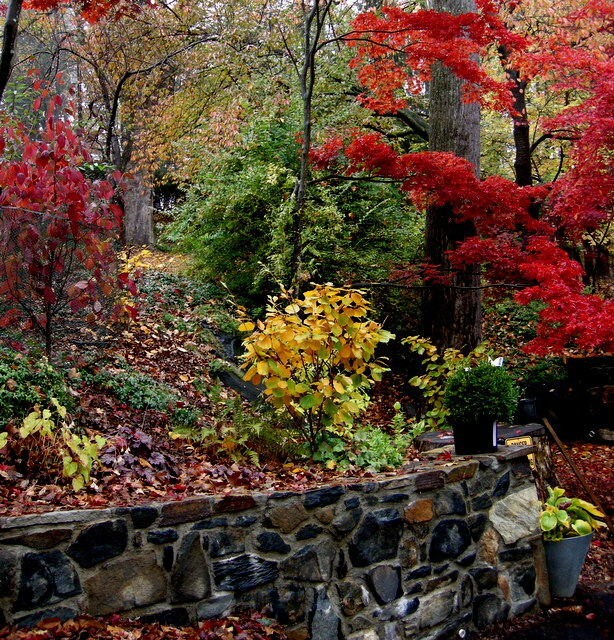 Mid-fall plants peak in October, and late fall plants grace November. As far as I am concerned, December is winter no matter what the calendar says. The first post in this series covered September bloomers, for details click here. This post features perennials and shrubs that make a daily walk through my garden worthwhile in October, even as the weather cools. The next post will feature plants for November. 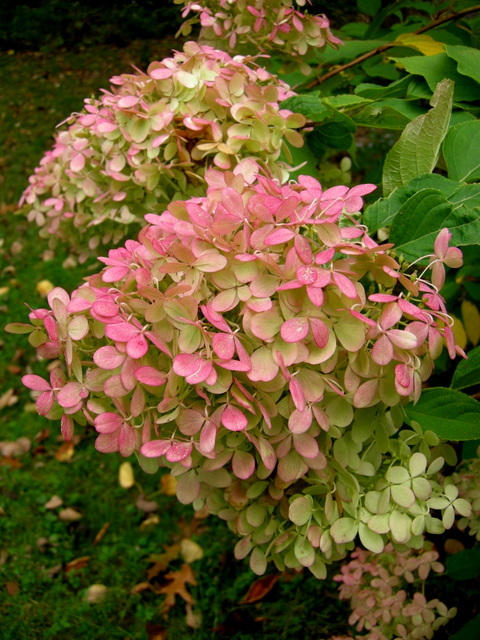 As the weather cools in October, ‘Limelight’ hydrangea’s flowers take on this lovely pink hue. 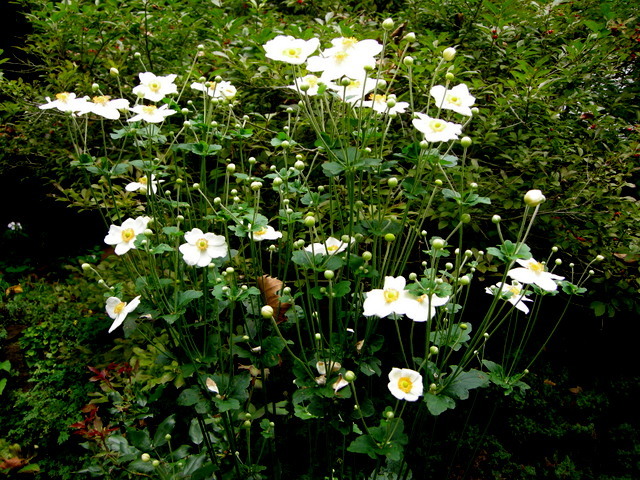 Some of my other favorite Japanese anemones like ‘September Charm’ and ‘Pamina’ may extend into October, but ‘Honorine Joubert’ is the queen, blooming throughout the month. 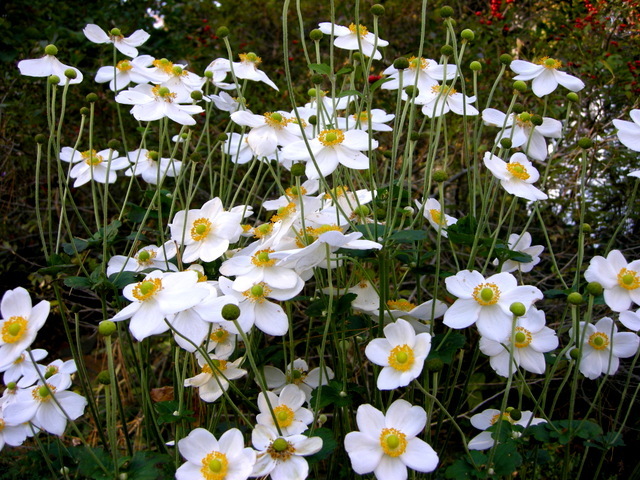 It also has the best habit and most flowers of any Japanese anemone that I grow. 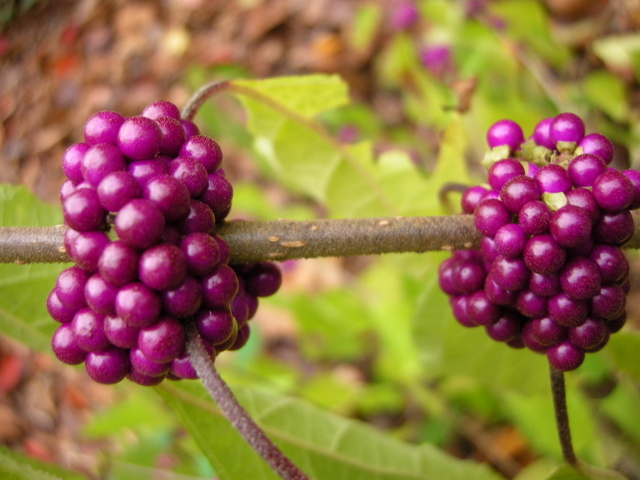 Berries are very important in October, and none is more eye-catching than beautyberry, here ‘Early Amethyst’, an Asian variety. 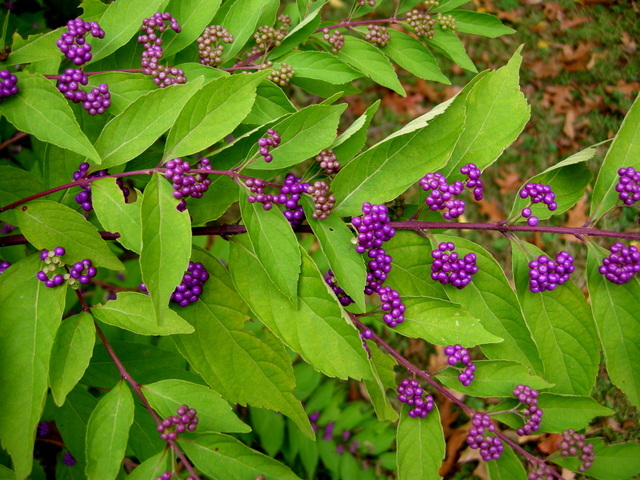 The unusual purple berries are elegantly set off by the lime green leaves. When the leaves drop in November, the berries persist. I actually prefer the cluster form and color of native callicarpa berries, but Callicarpa americana may have hardiness issues in our zone. I lost two of my three established plants last winter. The third is huge and vigorous though. My ‘Red Dragon’ fleece flower bloomed beautifully this year, and the purple leaves still look great in October. October is the month for fall-blooming hardy cyclamen and the wonderful leaves remain gorgeous all winter (photo taken at Chanticleer). 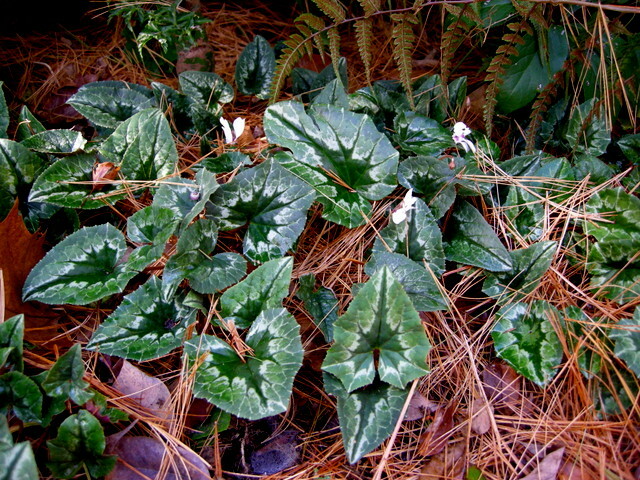 ‘Album’ is a white-blooming form of hardy cyclamen. 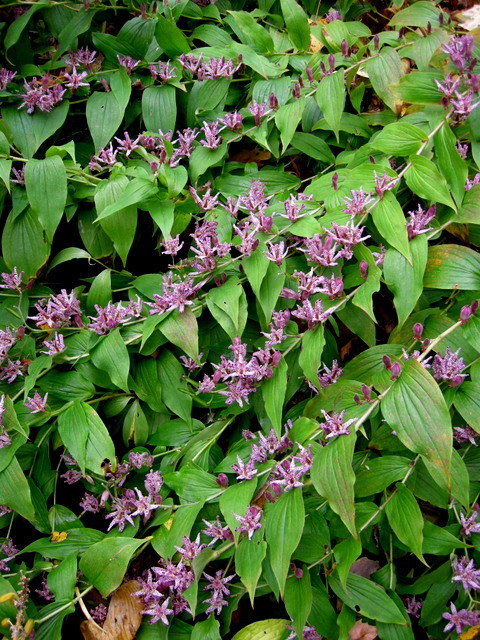 ‘Sinonome’ toad-lily is another outstanding October plant and continues full strength until the first frost. This photo was taken October 23, and plenty of unopened buds remain. A close up of ‘Sinonome’s orchid like flowers. Another toad-lily with a beautiful habit blooming in October at Welkinweir Estate Garden in Pottstown. 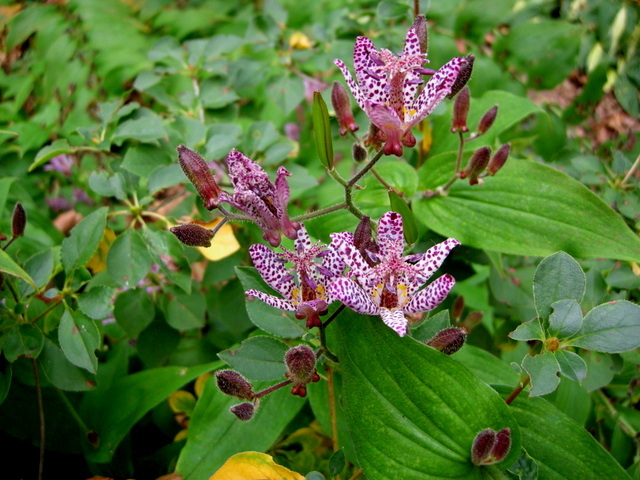 There was no sign, but it may be Tricyrtis hirta ‘Variegata’. Native threadleaf bluestar shines again in October when it turns this gorgeous yellow-orange, here at Chanticleer. Cimicifuga’s (actaea) soaring, beautifully scented candelabras are dramatic in October, here at the Scott Arboretum. Tartarian aster takes over when all the other asters except native blue wood aster (see first photo) are done. 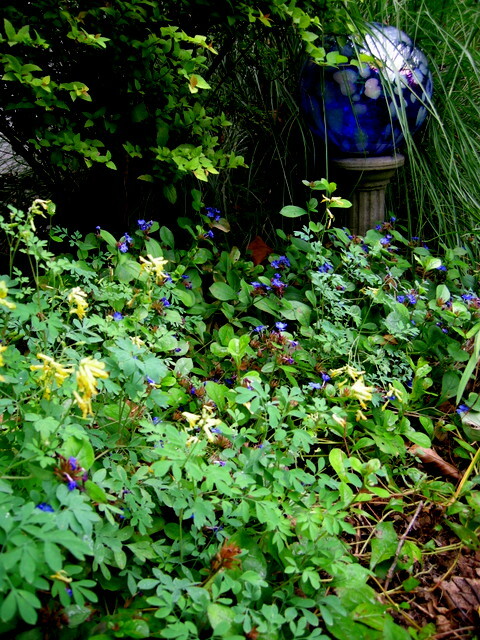 Yellow corydalis blooms all season and continues on into November, while the blue flowers of autumn leadwort start in June and peak in September and October. 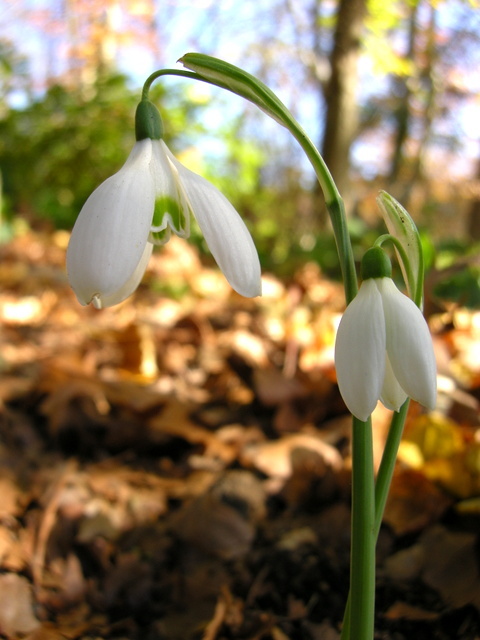 The fall-blooming snowdrop species, Galanthus reginae-olgae, sometimes called Queen Olga’s snowdrop because it was named for the Queen of Greece, always blooms by October 15. Shown here with my favorite lamium, ‘Shell Pink’, which flowers all season. 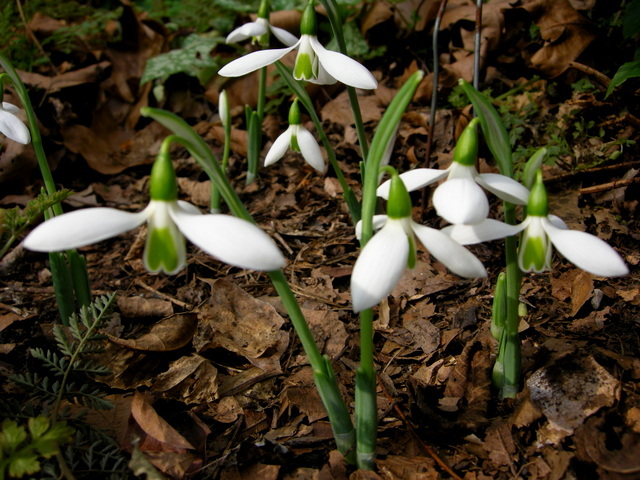 Galanthus reginae-olgae ‘Tilebarn Jamie’ is an improvement on the straight species with bigger, rounded flowers and two flower stems per plant. 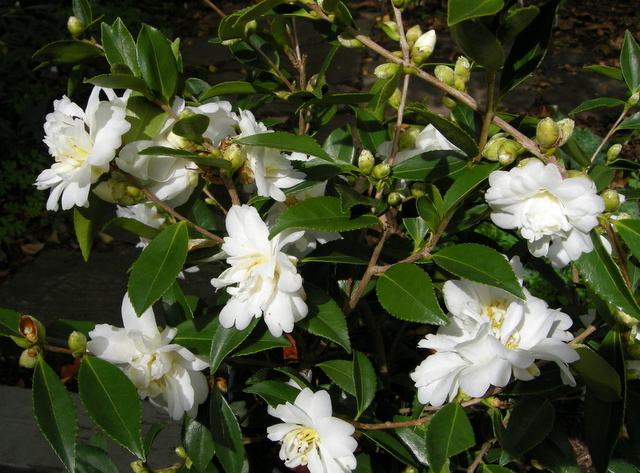 I am so thrilled that this spring, I finally found ‘Snow Flurry’ fall-blooming camellia to plant in my garden. 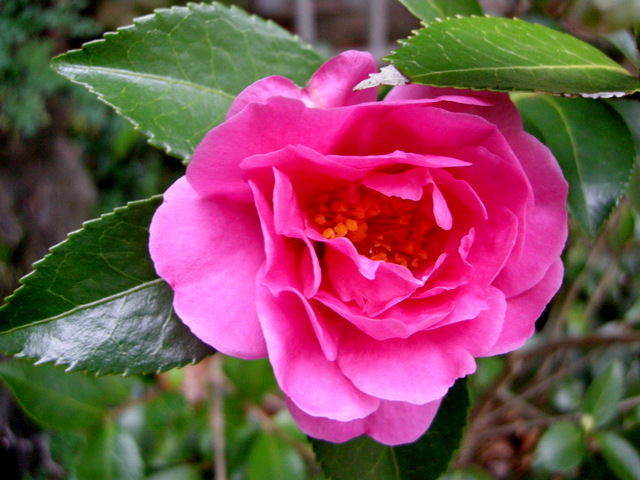 It starts the camellia season off with a glorious show in mid-October. 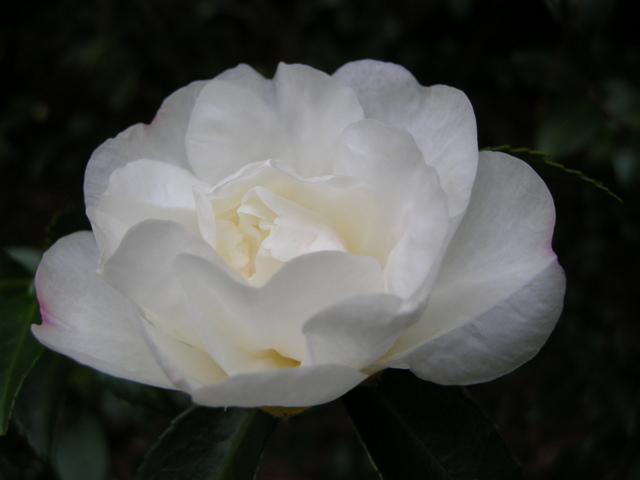 ‘Lu Shan Snow’ is my oldest camellia and starts the third week of October. 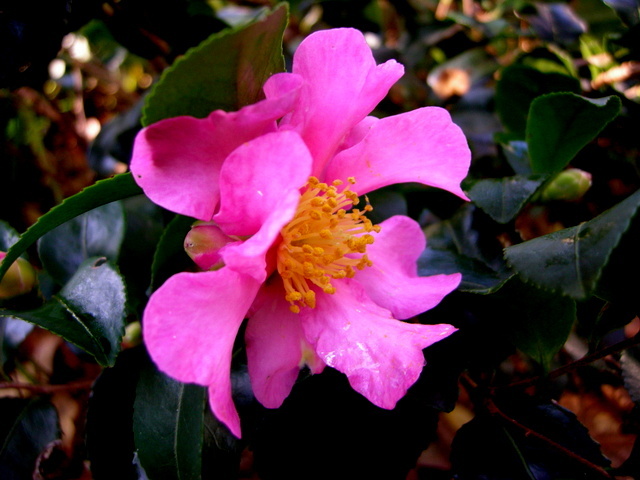 ‘Long Island Pink’ is another early fall-blooming camellia starting in mid-October. I planted it last fall, and it sailed through our terrible winter to produce a large crop of flowers this fall. 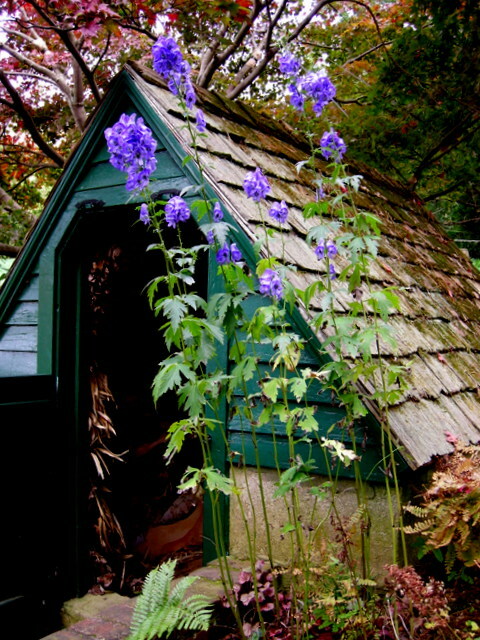 What’s Going on at Carolyn’s Shade Gardens This Fall? Fall is a beautiful time of year in the CSG gardens, especially right now while the sugar maples are turning. Blog followers who are also customers received an email in September letting them know that our nursery would not be selling plants this fall. Carolyn’s Shade Gardens (“CSG”) has gotten so busy in the last five years that we have been unable to do anything besides sell plants. By remaining closed this fall, we hoped to better prepare for spring, complete some much needed garden renovations, and make some capital improvements to our potting and shipping areas. This post will show exactly what we have accomplished so far. CSG uses a staggering amount of ground leaves to mulch the garden beds, and an equally large amount of pine needles to cover all of our paths. 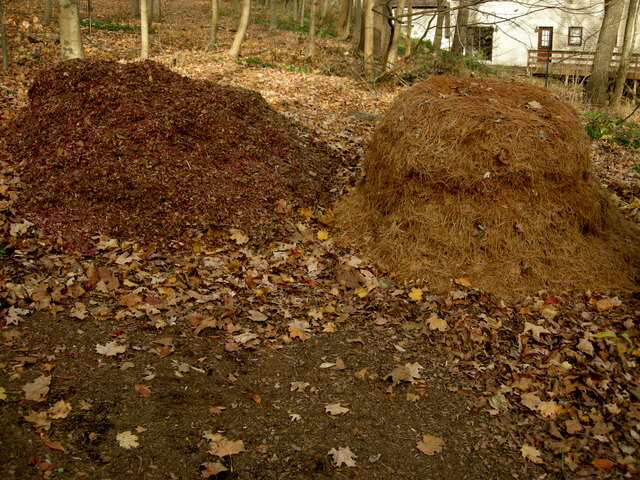 The photo above shows our stock pile for spring once the beds have been mulched and the paths refreshed (so the actual amount required is a lot more). The piles are about five feet high and wider than tall. Our own massive deciduous trees provide the leaves, which we grind in the driveway with a lawnmower. The pine needles are collected from the sides of local roads. 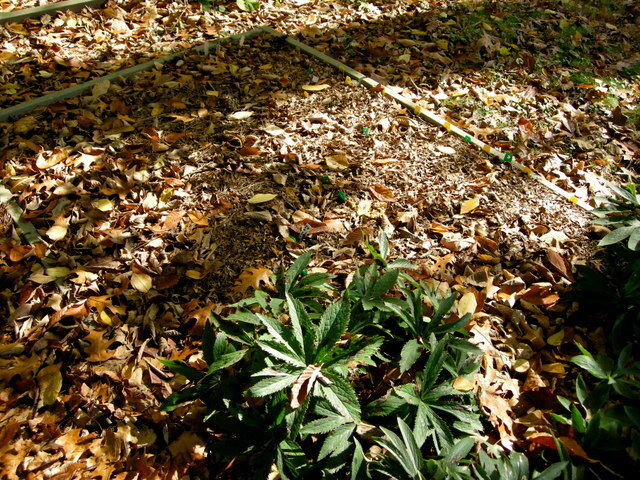 We highly recommend mulching with ground leaves. 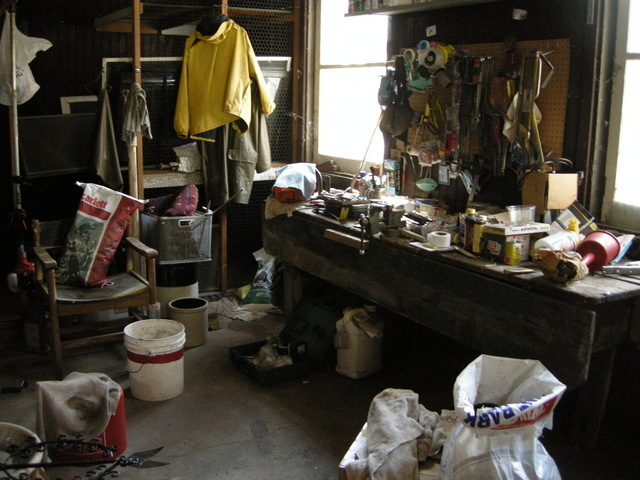 For step-by-step instructions with photos, click here. If you don’t want to do it yourself, my son and his business Practiced Hands Gardening can supply the ground leaves and do the mulching for you. Just email him at practicedhandsgardening@gmail.com. Extensive renovations have been completed to the terrace by our front door. The grass was removed so that we no longer have to haul a lawnmower down the narrow stone steps. We decided to try pine needles as a replacement. They are free and easy to install and refresh plus I like the look with the newly installed stepping stone path. Gravel might have been more suitable from a design standpoint, but the area floods occasionally so we decided to try pine needles first. 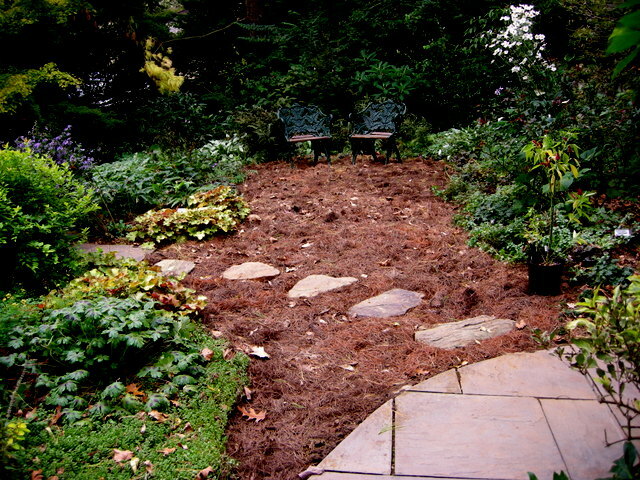 We also added more of many of the perennials that were working and eliminated some perennials that had self-sown to overwhelm other plants. The back of the rock garden on the first terrace is also being renovated. The area had filled in with vinca and self-sown garden phlox. 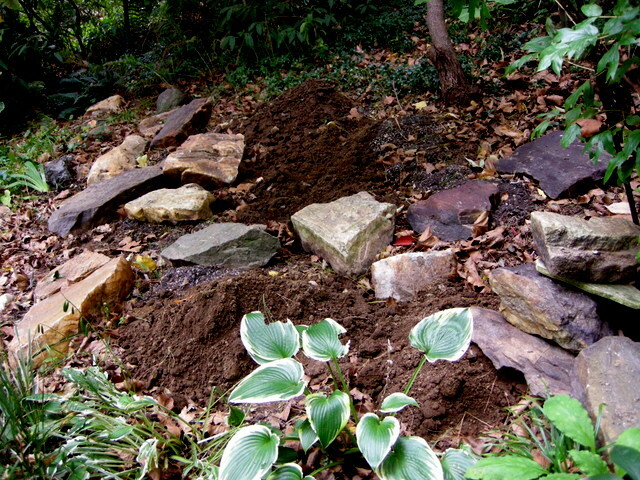 We are adding a lot more stones and hope to create a path through the middle for ease of viewing. We have moved a lot of trees and shrubs like this double Magnolia sieboldii, one of my favorites, which was planted at the bottom of the garden where the drainage is poor. Magnolias like to be well-drained so we moved it to a drier area up by the house. Six hundred pots of perennials are planted in the fall for spring sales. 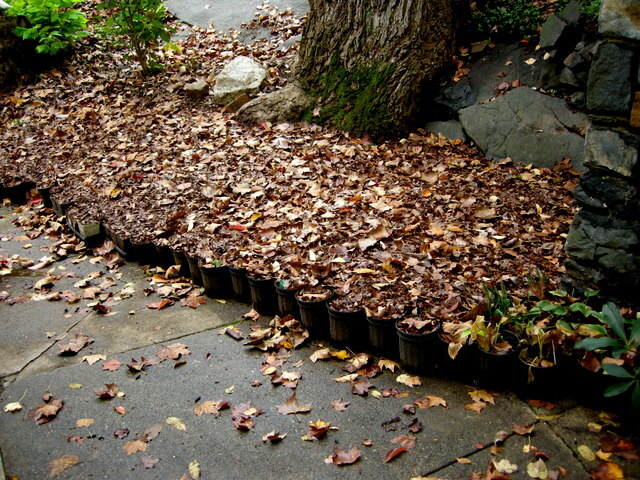 Here they are stacked next to our carport with an initial covering of ground leaves. Eventually the cover will be six inches thick. Some perennials do not do well in pots so we also plant a lot of stock in the ground in the fall. 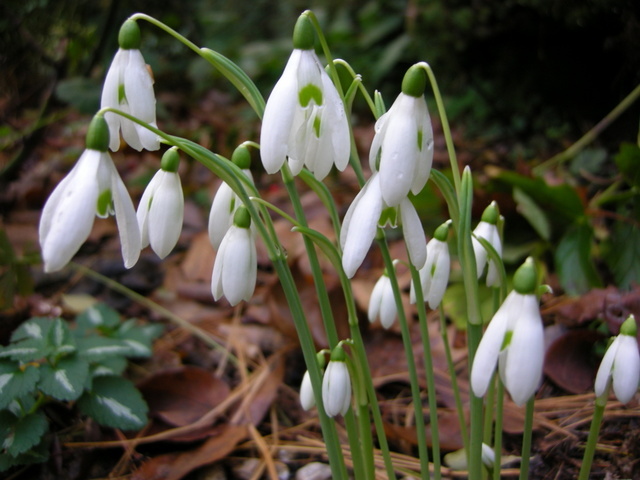 Snowdrops are propagated in the fall and planted in the ground for spring sales. 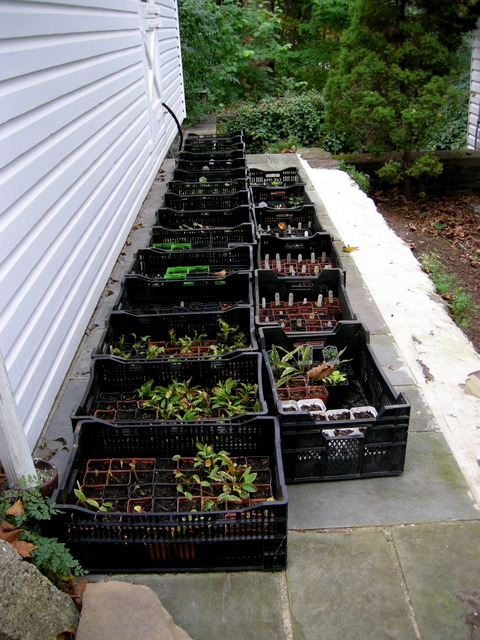 The photo above shows 21 crates containing 820 miniature hostas. We usually only winter over 20 to 30 leftover mini hostas. 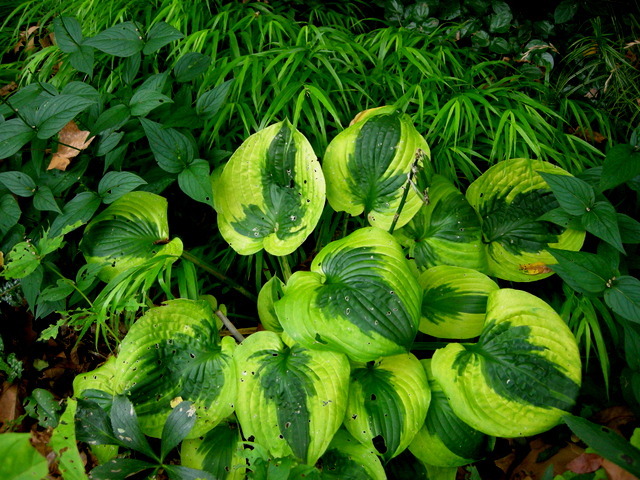 However, this year several of my wholesale hosta suppliers decided to close their businesses. I purchased and divided extra plants in the spring of cultivars that I want to try to keep going myself only to find out in September that my main mini hosta supplier, with whom I had already placed my spring 2015 order, was going out of business. We decided to take as much of our order as was left in stock and potted them up this fall. At least for spring 2015, many of your favorites, including several of the mouse ears, will still be available. Sadly, a lot of great minis like ‘Appletini’ and ‘Crumb Cake’ will no longer be available in the trade. There is a lot more to do outside, but we are also hoping to make some significant capital improvements in the carriage house to make potting the plants we grow here and shipping snowdrops and mini hostas more comfortable and efficient. Believe it or not we have spent weeks cleaning out this area in preparation for the renovations, but there is a lot more to do. More of the trees that power the CSG gardens with their leaves. What’s Blooming in Early Fall? 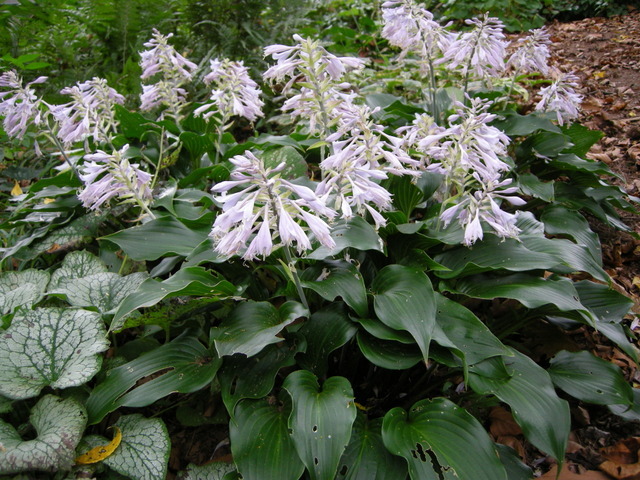 Hosta ‘Blueberry Cobbler’ is beautiful when it blooms in September. As I said in my last post featuring two glorious fall gardens, there is no area of Carolyn’s Shade Gardens planted to peak now. However, I have many beautiful fall-blooming plants, and the gardens are quite pretty in fall. These perennials and shrubs make a daily walk through the property worthwhile even as the weather cools. In this post I will show you what plants you can add to your garden to extend your blooms through September. The next post will feature plants for October, and the final post in the series will feature November. 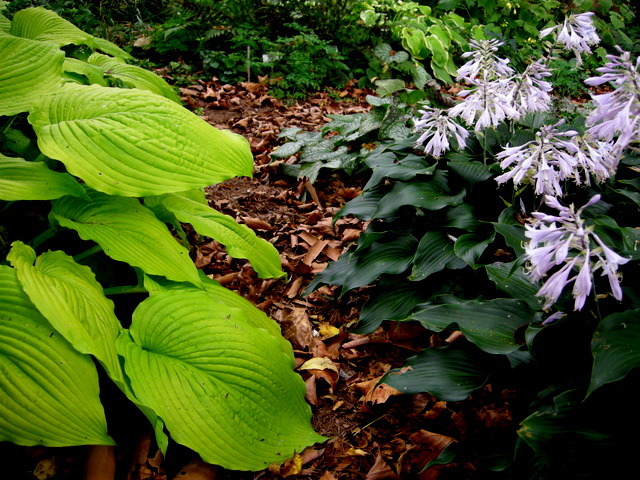 Hosta ‘Blueberry Cobbler’ on the right and ‘Jimmy Crack Corn’ on the left. Both manage to keep their leaves pristine through the summer. Yellow wax-bells, Kirengoshoma palmata, are a perennial with the presence of a shrub. 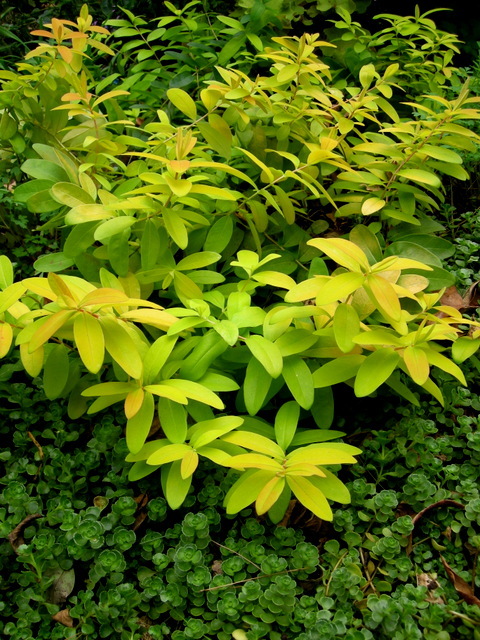 The leaves add interest all season, and the unusual yellow flowers bloom in September. 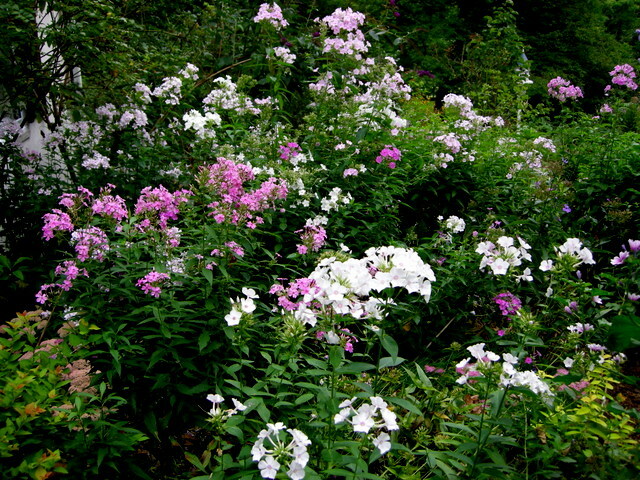 I cut my native garden phlox, P. paniculata, down by half in June and have flowers into October. Here you see the bed on 9/10 in full bloom with plenty of buds coming. Today 10/21, a few flowers remain but the phlox is mostly done. 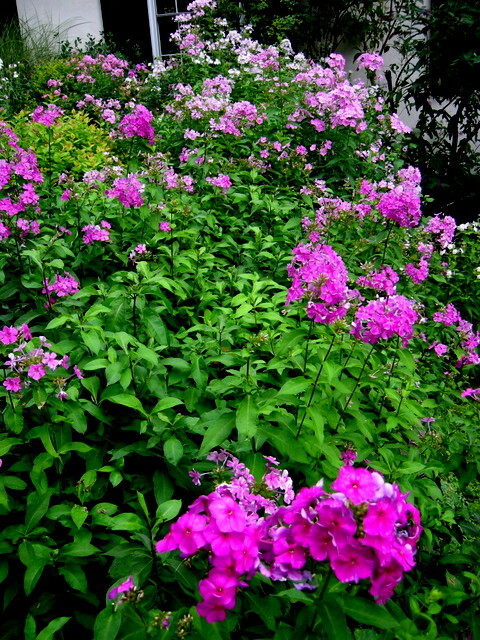 The phlox starts with white at one end of the bed and progresses through many shades to dark pink at the other. 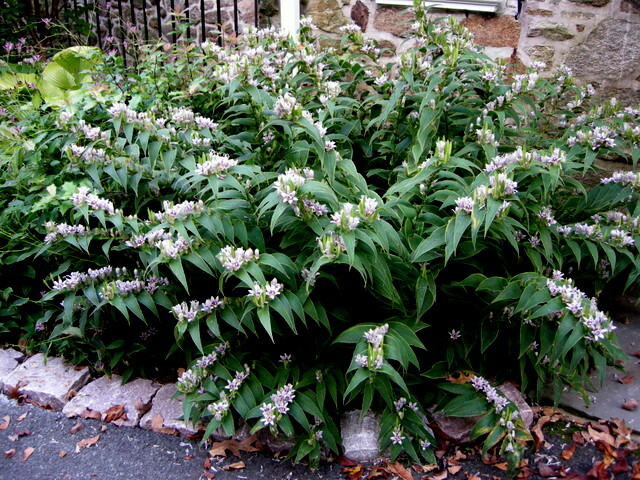 This native plant is great for butterflies, bees, and all kinds of native insects. This sedum, called ‘Mr. Goodbud’, was added this year to pick up the maroon blotches on ‘Katherine Adele’ hardy geranium. 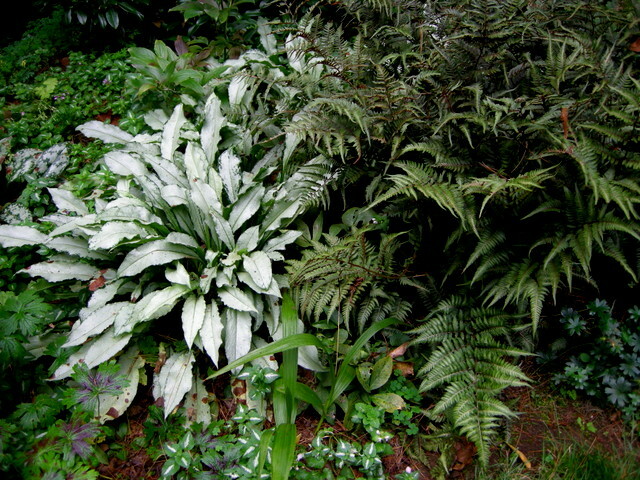 No flowers here, but I love the way ‘Diana Clare’ pulmonaria and Japanese painted fern look in the fall. 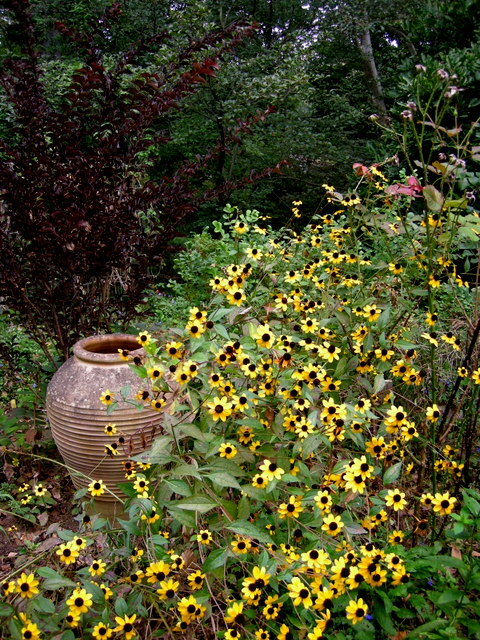 Native Rudbeckia triloba, ostensibly called brown-eyed Susan although I have never heard anyone use that name, with the purple leaves of ‘Delta Jazz’ crapemyrtle. This rudbeckia self-sows prolifically. Perennial native lobelias, both L. cardinalis (red) and L. siphilitica (blue) are very important to my garden in September, and sometimes they cross. Here you see great blue lobelia peeking out from behind a lobelia seedling. I often get white seedlings but never this amazing color. Hellbore leaves surrounded by cascading ‘Aureola’ Japanese forest grass, a wonderful fall combo. 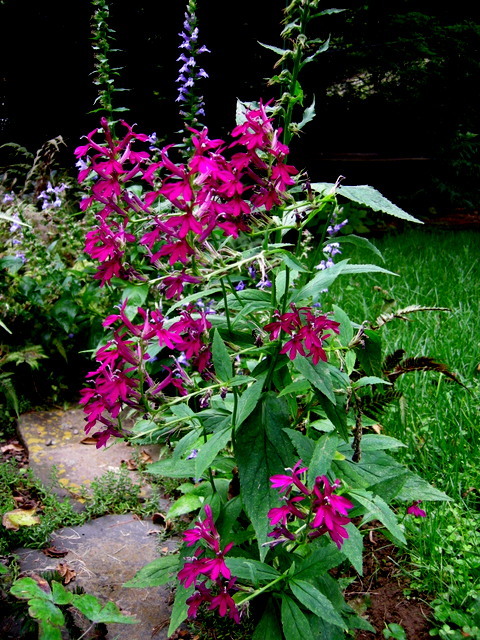 This is a perennial that fills the role of a shrub, but I have forgotten its name. There is a close up of the flowers below. Does anyone know what it is? 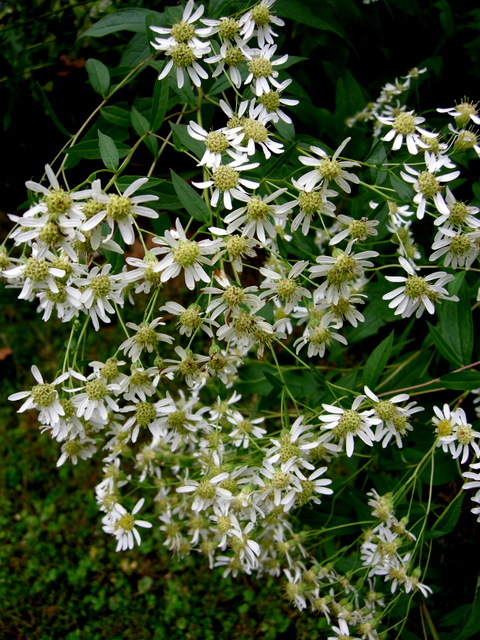 Note: Readers have identified this as PA native Doellingeria (formerly Aster) umbellata or flat-topped aster. 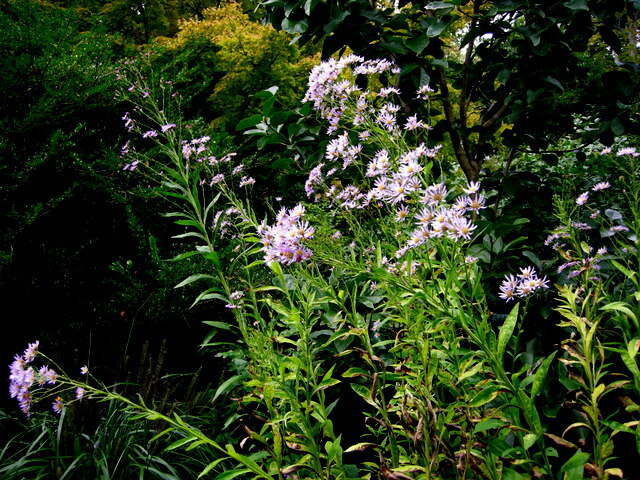 Although the habit of this aster is supposed to be upright, I think mine is flopping for lack of sun. I am going to cut it back in June next year to see if I can improve its habit. However, I like it anyway because the stems don’t fall completely to the ground. For more information on this plant, click here. 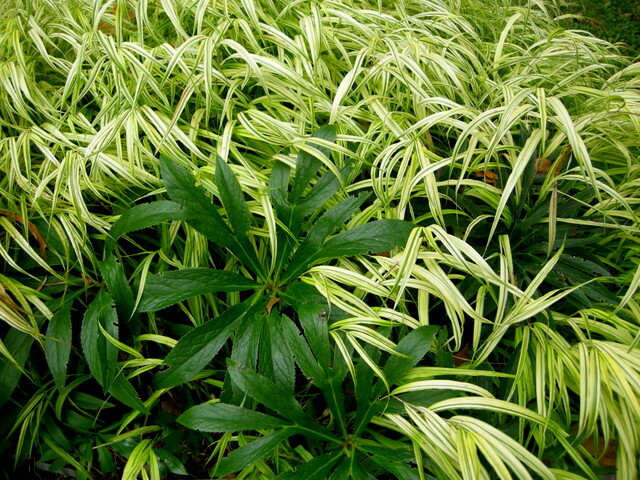 Hosta ‘Summer Lovin’ with native spigelia leaves and ‘All Gold’ Japanese forest grass. All three look great from spring through fall, and the spigelia even rebloomed earlier this month. It wouldn’t be fall without hardy begonia. Not my best photo but it went by early this year after a torrential rain. 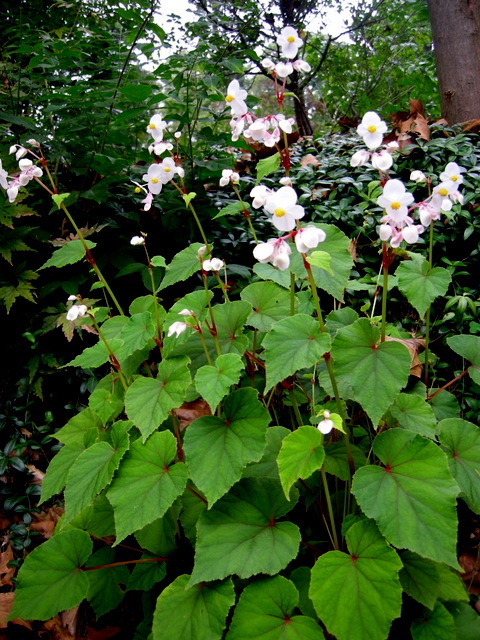 This lovely clump of the white-flowered hardy begonia planted itself on the hill by the drive. A glimpse of what is to come: ‘Honorine Joubert’ Japanese anemone starting to bloom on 9/29. It is in full bloom now.